Cover the eggs with an inch of cold water and bring to a boil. Boil for a minute, then cover and set aside for 10 minutes. Drain and then fill the pan with cold water. After 5 minutes, peel the eggs. Slice each egg length-wise and gently remove the yolks. Place the yolks and all the other ingredients in a small bowl and mash until very smooth. Mound the yolk mixture into the egg whites or transfer it to a ziptop bag and pipe it out. Wet your finger and pat the surface of the filling smooth. Using a toothpick draw lines to make the 'pumpkin' indentations. Sprinkle with paprika if desired. Cut up the green part of the onion to make tiny stems and add them to finish off the pumpkin look. These look fab! I love Thai spice and they look so festive for this time of year... YUM! Thank u, Patty! Glad you liked them! These look so festive fo Halloween. But I have never seen eggs this large even the XL ones at the grocery store aren't this big. Am going to make these for our family Halloween mix! 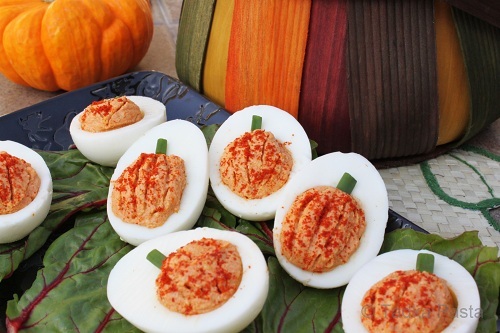 What is your secret to keeping the paprika off of the white part of the egg? Thx! Try turning the finished egg upside down on a bowl of paprika and dip rather than sprinkle? We just took a pinch to sprinkle each one. And then use a small brush or paper towel to wipe off any spills. 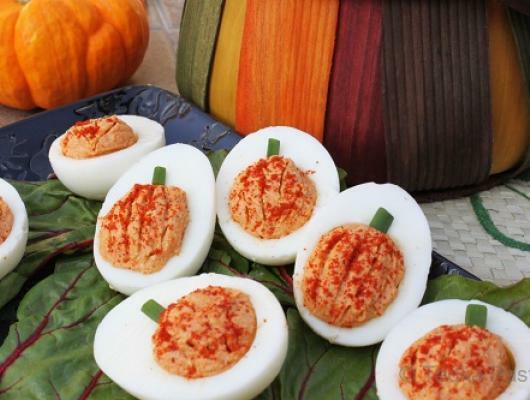 Thai-spiced Deviled Eggs masquerade as portly pumpkins.